Come celebrate 35 years of Be A Champ! We have trained over 13,000 students from 33 states. Just ask them! Many attend every year. They are the good ones! Your showing experience isn't complete until you've been to this camp! 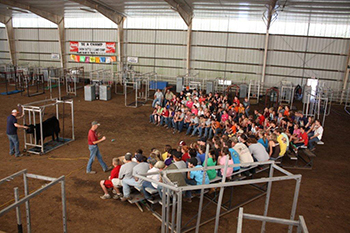 We teach basic and advanced showmanship, clipping, grooming and feeding in a camp geared for 4-H and FFA students! Up to the minute techniques taught by professionals. Even a best way to slick shear! We not only teach how to win, but how to be a winner. Get the "real" thing and it is still inexpensive. The $375 fee includes meals, lodging, entertainment, swimming, souvenir T-shirt, special awards and all you can learn taught by the best in the business. Each camp is limited. Applications received often exceed space limits, so send in your application early! Be A Champ Campers are successful in show rings around the country year in and year out. 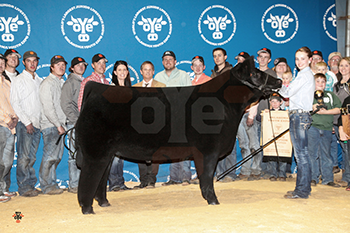 One of our most recent success stories comes from former camper Madison Hudgins of Mannford, OK who showed the Grand Champion Steer at the 2014 Oklahoma Youth Expo.